It can be your car key, your phone, or aunt Mary’s Chocolate Cake recipe. How often do you look for things in the wrong place just to realize, after so much effort employed in the quest, that you were just off track? Notice they are always in the last place you look, aren’t they? 😉 What if you had gone to that place first? Well, they still would be the last place you looked! The problem with us, humans, is that we overlook things. Our minds are too busy because our egos are hard at work trying their best to create a safe and logical human life for us. That way, we get trapped in our own logic and we lose track of our intuition; we lose track of what’s beyond what we see. That’s when we walk by the lost object five times and don’t perceive it’s there, just behind the pile of mail that we, ourselves, set on the desk. We don’t see what’s there because we don’t listen to our inner voice; and we don’t see with our third-eye. We have numbed our senses and stopped perceiving life with our essence, consciousness, higher-self. Because we’ve disconnected from the Source, we walk around like a headless turkey, not knowing where to go, what to do. Yes, right there! We do exactly the same thing when we are looking for answers to help us in a more abstract or philosophical life situation. We cast questions left and right, but don’t know where to look for the answers. Answers are usually right there, but we don’t see them. “Well, well, well… why are some people so narrow-minded? See, you pushed the button Ask Questions, but it didn’t say that you would have answers, did it? You must use the right buttons, of course! For answers, try the Find Answers button. It’s over there, on the bottom left side of the page, can you see it? This is what is wrong with most students… they have a narrow focus, their creativity is numbed and their sense of logic is handicapped. They prefer to ask rather than observe and think. TIP # 1: To find out things, therefore to learn more, you must broaden your scope, look around and beyond the ordinary.” Saying that very emphatically, the purple gleam disappeared. The above excerpt is from a philosophical science-fantasy novella, that will bring you to a virtual reality along with amazing characters in a quest to finding answers, solving riddles, and resolving daunting challenges. 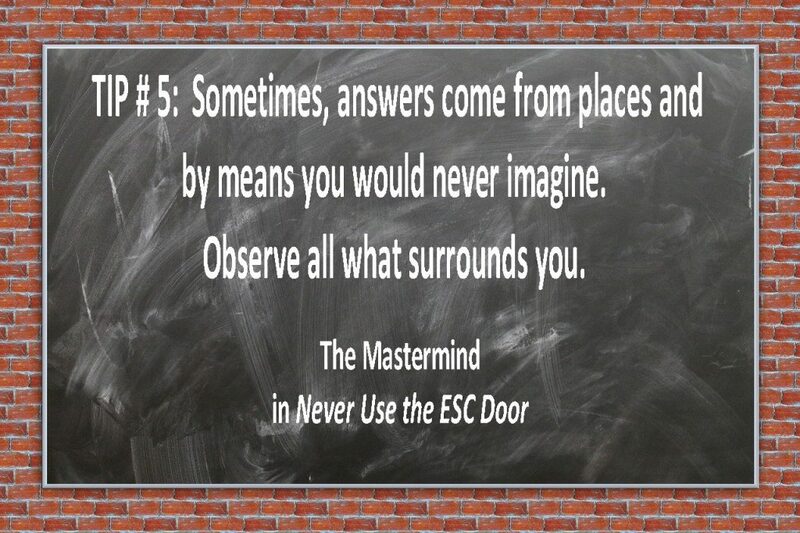 Francesco and The Mastermind’s dialog in this short novel, Never Use the ESC Door, is a good example of our daily struggles in finding solutions to what we perceive as problems. The story is a fantasy, but it reflects much of our minds, fears, and limitations. Better yet, it give us clues and insights on how to overcome such challenges. I’d say look at the big picture; but also don’t lose track of details – just don’t let them blind you. It’s like using your peripheral vision. Don’t stare at problems, because you won’t find the solutions there. Broaden your scope; like when using your peripheral vision, you’ll notice what’s around. I recommend you dive deeper in this great set of tips and insights given by The Mastermind, while enjoying the adventure of these five characters in search of bettering themselves. How they face their fears and challenges is related to all of us, in day-to-day life; in one way or another. You’ll enjoy it, and certainly find a lot of inspiration, too! Books entertain, educate, and inspire us. They show us different worlds and sharpen our perceptions. we dive into deep universes and unveil a new portion of our human potential. After you read this book (and I hope you do! ), or if you have already read Never Use the ESC Door, how about leaving a comment below? Your perspective about the book may help other people, and book discussions are always fun! You may even ask questions, if you want. Keep an eye on the thread updates. 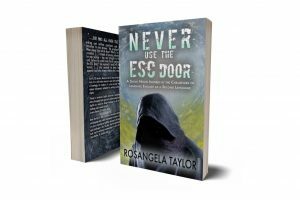 “Never use the ESC door” is the kind of book that we can learn from and have fun at the same time. Rosangela uses a very simple and funny language to explain boring rules and other things that can be hard to learn. The story took me along to figure out upcoming events while I was learning about grammar, idioms, and different cultures. For those who enjoy a well written book, smooth reading, and learning with fun, this is the book!